Successfully Added 802.11N High Speed Wireless USB Adapter to your Shopping Cart. 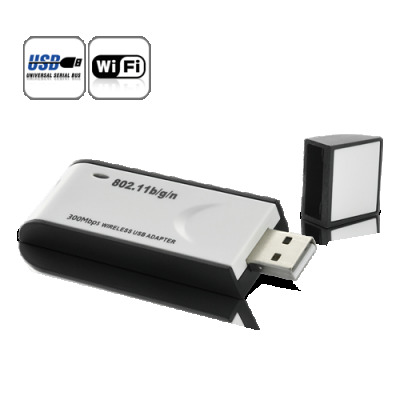 300Mpbs High Speed Wireless USB adapter on 802.11N with fast and simple installation for instant internet access. If you're looking for the easiest way to connect to your home router or WiFi network, then check out what this amazing item has to offer. This convenient plug-and-play USB dongle provides you with the fastest available wireless internet connection without the need to buy a new computer or go through the hassle and expense of trying to upgrade your existing computer. Simply install the software, plug in the USB dongle, and you're set! This amazing WIFI adapter also comes with an indoor range of up to 100M and an outdoor range of up to 300M, which means you can check your email on your laptop or go online through the PSP from anywhere in the apartment. Just when you thought it couldn't get better, feast your eyes on the blazing, next generation 802.11N data transfer speeds. Even though this wireless USB adapter supports the previous standards of 802.11G (54 Mbps) and 802.11B (11 Mbps), the new 802.11N standard is over 5 times as fast and provides an amazing 300 Mbps data transfer speed. Even better, it also come with RTL8191SU chipset, which is a highly integrated single-chip MIMO (Multiple In, Multiple Out) Wireless LAN (WLAN) USB 2.0 network interface controller complying with the IEEE 802.11n specification. It combines a MAC, 1T2R capable baseband and RF in a single chip, providing a complete solution for a high-performance wireless client. The 802.11N High Speed Wireless USB Adapter is in stock now and available for single and bulk purchases, Click "Add to Cart" now and we'll ship you a sample the very next day, brought to you from the leaders in China factory direct wholesale electronics, Chinavasion. How fast is 300 Mbps? 37.5MB/s downloads. Yes, it is insane, although very few websites would let you download that fast unless you owned it. on 2011-10-12 02:01:45 does it use a sim card? does this device use a mobile phone sim card? This device works perfectly, the software came in a Mini Disc that my computer couldn't read, nevertheless Chinavasion sent me the required software for me to download the drivers and now I have wireless internet on my Computer! Thanks Chinavasion, for the great quality products and the awesome support! This works and if your computer doesn't have wireless LAN, you should totally buy this!